Four crew members were picked up by another boat after a fishing vessel sank off Hacketts Cove, N.S., on Saturday morning. 4 crew members picked up by another boat after vessel sinks off Hacketts Cove, N.S. Four crew members are safe after their boat sank and they were rescued by another vessel on the first day of lobster fishing season on Saturday morning. Michael Fralick, uncle of the boat's captain, said the crew members are shaken up, but otherwise OK. They were in the 5 C water for 10 to 15 minutes before they were picked up, he said. "It was long enough," Fralick said. "You wouldn't want to be in it very long. It's pretty numbing, very cold." Fralick said the Charlene A. had a complete overhaul this summer, "so we're thinking something went wrong." The boat will need the engine and electronics replaced, but Fralick said it will be back on the water. He said he was at home eating breakfast when he got the "very unnerving" call that the crew was in trouble. "Luckily it turned out the way it did here today. It could have been a lot worse," Fralick said. "Vessels and motors and electronics can be replaced, but people can't, so it's good we're all here." Fralick said he expects the crew will be back fishing soon. Joint Rescue Co-ordination Centre spokesperson Maj. Amber Bineau said all crew members were wearing safety gear. "We're happy and relieved to know that the individuals were in fact wearing personal flotation devices and that there were other vessels in the area that were able to rescue them that quickly, especially in the waters at that temperature this time of year," Bineau said. The owner of the vessel towed it to the wharf at Hacketts Cove and used excavators and backhoes to haul it up onto cribwork. 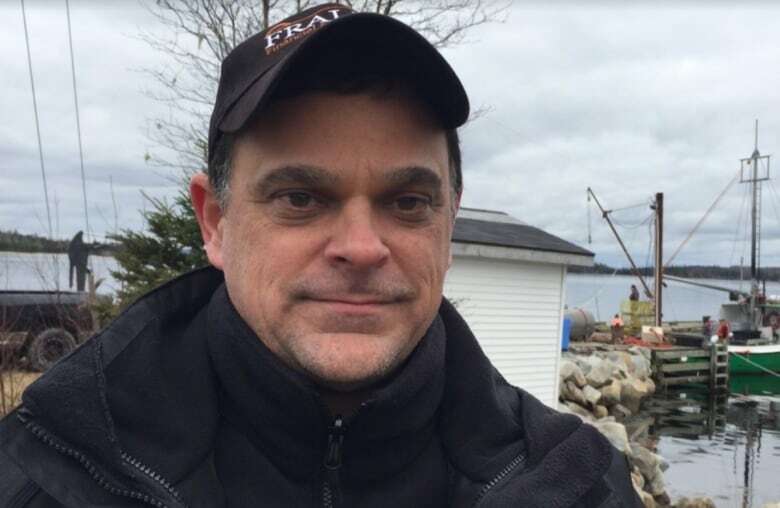 Keith Laidlaw, the deputy superintendent for the Coast Guard's environmental response team, said although the fishing boat had about 400 litres of diesel fuel on board, none was released. However, Coast Guard crews are on the scene using absorbent materials to clean up 30 to 40 litres of hydraulic fuel that leaked. A skimmer, a machine used to remove oil from the surface of the water, was en route to Hacketts Cove early this afternoon. Laidlaw said it's unclear whether the vessel is a writeoff. "The owner and his insurance company will have to figure that one out," he said. "Obviously the engine room would have been flooded, but boats can be put back in service relatively quickly." 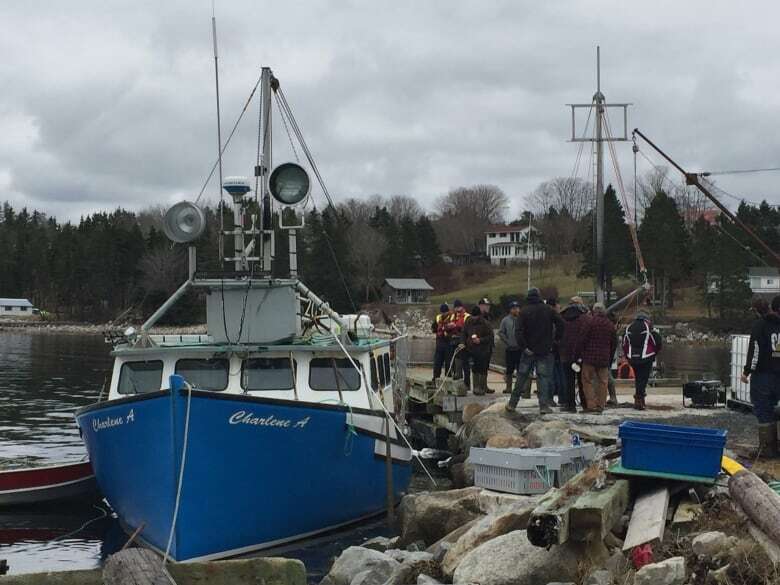 A second vessel was towed to shore in Clark's Harbour at about 10:30 a.m. after it began taking on water. The JRCC said the crew managed to stop the water from coming in, but the engine wasn't able to start, so the boat couldn't make it to land on its own steam. The crew remained on board as it was being towed. 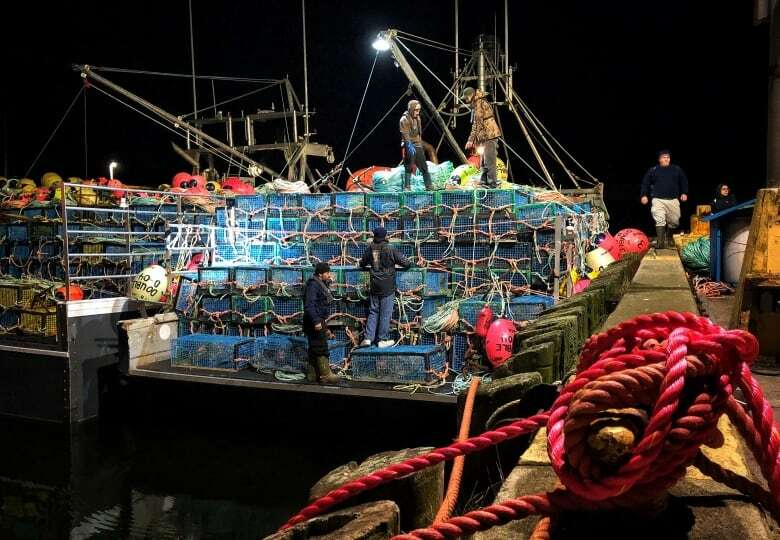 Dumping Day, the day fishermen drop their traps into the water, is often regarded as one of the most dangerous days of the fishing season, since boats are loaded full of traps and rope and ride lower in the water than usual. 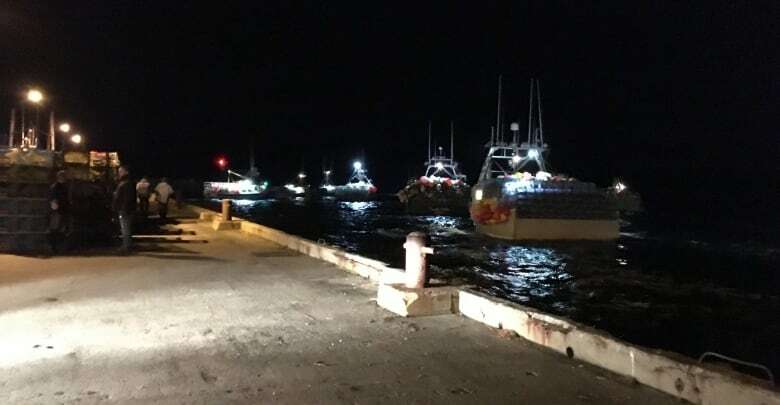 Hundreds of fishing boats left the wharves in communities across western Nova Scotia in the dark of early Saturday morning for the first day of lobster fishing season. Lobster season usually starts the last Monday of November in this area of the province. But representatives of fishing associations, with consultation from the federal Fisheries Department and Environment and Climate Change Canada, decided to postpone the start of the season due to high winds and rough seas in some areas which could have compromised safety. Retired Rev. Bill Newell got up early to deliver the blessing of the fleet at Cape Forchu, outside Yarmouth. 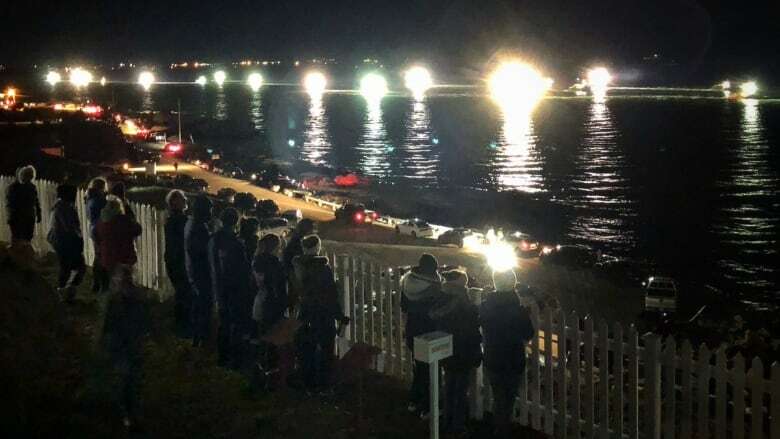 Just a couple of minutes before 6 a.m., when the boats are permitted to make their way out of the harbour toward the fishing grounds, Newell said a prayer for captains, crews and families. The blessing, which is broadcast on local radio station CJLS, is often picked up by fishing boats as they head out to sea. "I prayed for safety and not taking any unnecessary chances, and for a prosperous season and a safe trip home," Newell said. "And I prayed for the people who are behind them who are at home, because they're very much a part of the whole thing as well." Newell said many fishermen feel anxious in the days leading up to the start of the season. "They're just sort of chafing at the bit and want to get underway," he said. "I know my son-in-law — and I'm sure he's not the only one — has trouble sleeping for the three or four days before the season. Just anticipation, wondering how things will go, what the catch is going to be, what the price is going to be, all those type of thing." In Sambro, where fishermen were permitted to start their voyage at 7 a.m., about 40 people gathered at Mishoo's, a convenience store and takeout that opened three hours early to welcome people before they set out. Staff served coffee, doughnuts and sandwiches, and later set off fireworks on the wharf. Ellie Gray, who works in the kitchen at Mishoo's, said the mood on opening day is like Christmas Day because everyone is happy and excited. "We're the loudest ones over there because we're wishing them well and be safe," said Gray. "I don't know if they get embarrassed or whatever, but we don't care. We let them know how we feel because we want them to be safe and have a good trip and come home." Lobster fishing areas 33 and 34, which include the coast from just east of Dartmouth, down the South Shore all the way up to Digby, comprise Canada's largest commercial lobster fishery. According to DFO, fishermen in the area last year recorded landings worth $502 million, about 57 per cent of total Canadian lobster landings.